Preface: Okay, so it's been approximately two months living at MIT, but life is rather hectic. I do realize that the audience of this blog favors the storytelling-type articles over the technological articles, but you now have a dose of both. Orientation was for the first week or so. I took two Advanced Standing Exams to hopefully pass out of Multivariable Calculus and Physics II: E&M, which I did. Doesn't it feel nice not having to take physics for the rest of your life? :) Another notable event during orientation was the East side vs. West side water wars, in which East side completely obliterated West side. Oh, those preppy sissies. Towards the end of orientation was freshmen registration day. Having previously looked through all the classes I would have to take for a Course 6-3 (CS) and Course 15 (Management) double major, I had a decently good idea of my schedule. I then took the form to the Student Services Center to register for classes! 6.172 is EPIC AWESOME. It's a competitively graded lab-based class, not unlike TopCoder. The material is not difficult to grasp, but working with projects with multiple source files (including a Makefile) is certainly different than trying to jam everything into a main function in USACO or one file in my personal projects. Also, learning how to comment code and write comprehensible documentation has been very useful. The one note about this class is that it requires an enormously huge time commitment: you could always be trying out new algorithms, implementations, or bit hacks to increase the efficiency of your code, but either end up making the code slower or introducing new bugs . BUT THE CLASS IS JUST SO FUUUUUNN! 7.012 is boring. Dr. Bajwa has drilled down the content surprisingly well. 14.02 is interesting, but I don't see how one learns from a 50-minute lecture in which the professor teaches a whole chapter. I would rather spend 90 minutes at home to take notes from the book and later reinforcing by reading the lecture notes. 21W.732 is pretty sweet. As its name suggests, we use digital media: our past two assignments were to create an audio clip and video clip that captures the essence of something (not necessarily the same). I was plenty happy to exercise my ninja iMovie and GarageBand skills. The first wave of midterms were the previous week, which is why I did not publish this post earlier. Okay, enough about classes. Dorm life has been pretty interesting. I live in East Campus, which is infested by [mostly] EECS and some MechE nerds. Most of the floors enjoy building and destroying things. Tetazoo, the floor below mine, is obsessed with fire. I've already found a few places from which to acquire free but workable hardware (mostly computers, for now). 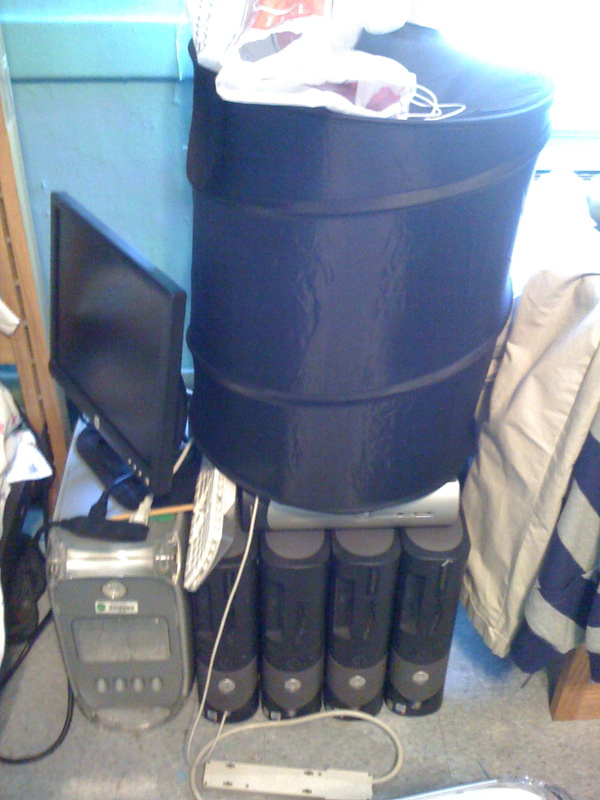 My collection of computers (besides my quadbox and MacBook Pro) includes four Dell Optiplex GX270s, a Power Mac G4 Quicksilver, and a Power Mac G4 MDD. (Hmm should I pick up a Power Mac G4 Sawtooth just to complete my collection?) The Dells will be used for an experimental cluster and the two Power Macs (which I carefully gutted) will be used for case mods: one for my webserver, which currently just sits open on a counter, and the quadbox, which resides in a 15-year-old case (complete with its `Intel Inside Pentium II' and `Windows 95 compatible' stickers!). 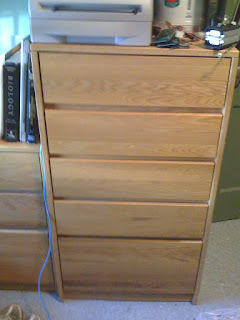 The Quicksilver Power Mac is my nightstand, on which resides a 17" Dell flat panel I obtained. The MDD Power Mac is at home to be case modded, which is currently underway. 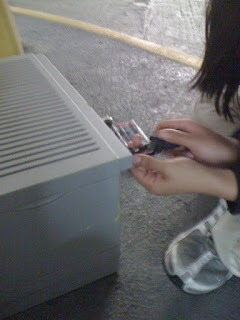 One more note: There is a surprisingly small number of people who are both hardware maniacs and have an aptitude in computer science/math. Also, I have yet to meet someone as interested in cars as I am. Maybe it's time to go to MITERS and FSAE (Formula SAE)! Writing Rickroll lyrics on hall whiteboard. Oh no! 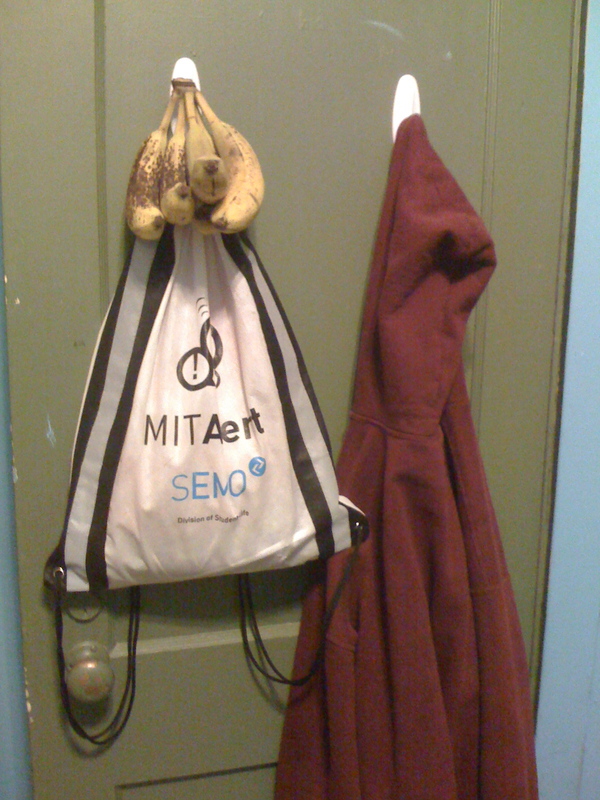 MIT Mobile app says I've fallen out of MIT! USB pet rock I got from the Google Tech Talk! The GM Alternative Energy group brought some of their cars outside of the Z Athletic Center for `show and tell.' Guess who got distracted from going to her makeup swim test on time to talk to an engineer for approximately 15 minutes? =D The above picture is a shot of the Chevy Volt interior. Chevy Volt steering wheel and instrument panel. GM Fuel-Cell Equinox right-side sticker. Trunk of Fuel Cell Equinox. Notice the huge buldge needed to hold the hydrogen tank. 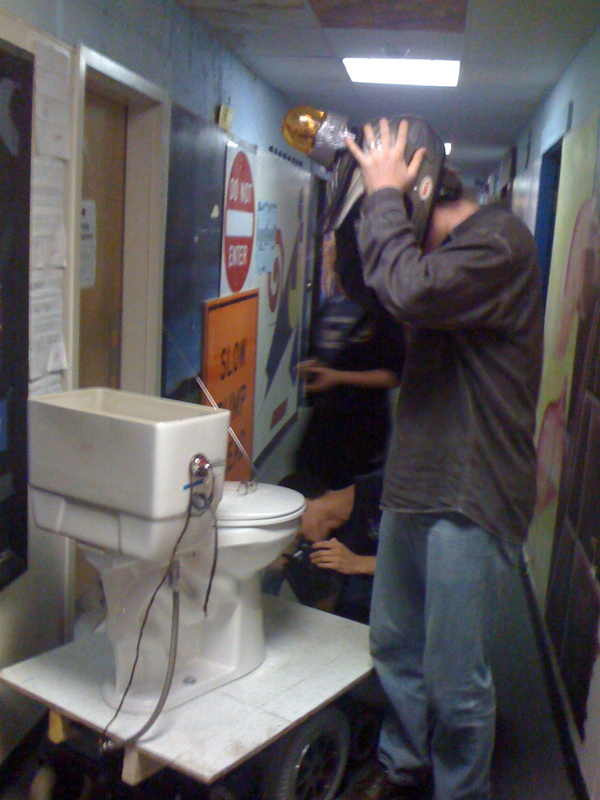 Professor Steve Johnson (Applied Math) came to 4th East to ride our RC toilet chair! Bayley foraging for something good. Carting them back to EC! What do we have here? 2x750MHz Sun Sparcs with 8x256MB RAM! Nice find, Bayley. Resort in which CSAIL Student Workshop was held. Heading to the resort's beach for lunch! That guy in the pic is a first year PhD candidate in CS. He did his undergrad at Harvard in CS and was Mark Zuckerberg's CS II teaching assistant! ITA's tech talk. Apparently they do some pretty neat stuff (i.e. NP-complete problems). Awesome error message in ITA's iPhone app. Payoff vs. Intelligence graph, part I.
Payoff vs. Intelligence graph, part II. Error message on Stata flat panel TV. This is the first MIT-owned computer running Windows that I've seen. Microsoft! 1 Memorial Drive, Cambridge, MA 02139. 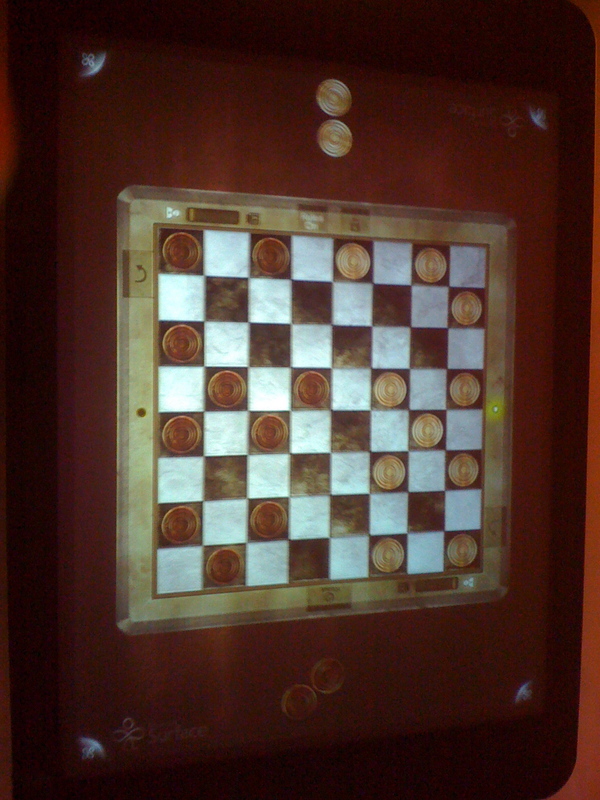 Checkers on Microsoft Surface. The touch screen requires a bit of effort to use. Cupcakes! Quiznos was catered for dinner. Trying out Xbox Kinect (Project Natal). 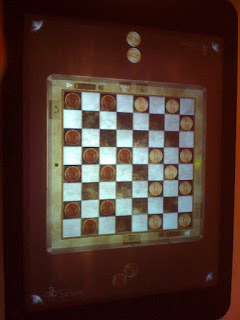 It works really well and is much more intense than Wii games. Here is my desk. Maybe I should clean it up. Here is my dresser. It has more electronics than clothes. I discovered that clothes belong on a clothes rack because electronics don't. Here is stuff on top of my dresser. I think I need more real estate. Here I am looking at four different source files of evilwm. Vim split is pretty awesome. Here is the Power Mac G4 Quicksilver I hauled home by myself. The trick to carrying it is to *not* hold it by the handles, but to carry it by your side and support it from the bottom. The commitment part is irrelevant for me because I'm limited to 54 units of class! Man, my head does not work on weekends. Already four errors have been caught; I wonder if there are more. Start scrutinizing, everyone! Also, I want a Google pet rock, give it too my mom and tell her it's a functional device.